It’s always a sinking feeling when you’ve delivered a design and have second thoughts. You know you could have done better. We’ve all been through that of course. We strive for perfection knowing we’ll never quite get there. Yet, we struggle to keep up with shifting trends. Do not beat yourself up about what is a relatively common occurrence among web designers. Instead, you should take heart in knowing there’s a relatively simple way to do better and do better fast. While there’s no such thing as a free lunch, there is a pretty good deal at a very reasonable price. 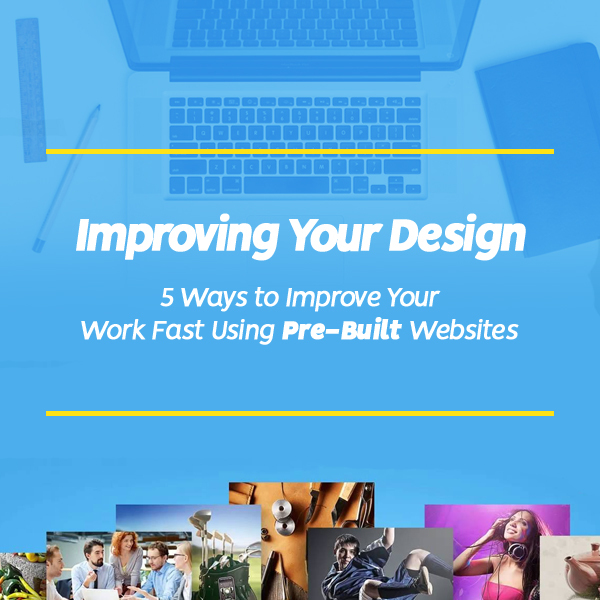 We’ve created a checklist just for you that offers 5 ways to improve your designs with pre-built websites. Maybe you’ve heard about pre-built websites. You might look upon them as a lazy man’s approach to design or a poor substitute for creativity. After all, how can you take pride in using a ready-made design instead of one of your own making? Pre-built websites are not a substitute for creativity. However, a good dose of it has gone into the design of each and every one. Far from placing constraints on your creativity, they actually help you get a project off to a fast start. They give you confidence, provide inspiration, and they get your creative juices flowing. In short, you’re getting something that’s very good and making it better. Be Theme has 390+ pre-built websites (with more to come) and it’s all yours for $59. These examples from Be Theme’s library demonstrate how they can work for you. 1. Am I up to speed with the latest trends in this industry? Take the fashion industry for example. Design trends have tended to focus on many of its evergreen characteristics. Colors and textures have been rich. Websites have tended to be overcrowded with bold visuals. If you stick to those trends this year, you’ll find you’re suddenly behind the times. Today’s fashion websites are following a trend that features lots of white space. They feature black and white sketches and minimalistic menus. A pre-built provider like Be Theme knows that. You’ll see how they’ve kept in sync with the latest trends in this industry in their new series of fashion templates. 2. Do I know for sure what NEEDS to be on the Homepage? Distinguishing what you want on a home page from what needs to be on it can be a problem for any web designer. On the surface, it seems to run counter-intuitively from being genuinely creative. In addition, homepage design requires a careful blending of art and science. It can be difficult to achieve when you start on a new project. There’s a ready solution to both of these problems. It’s called a pre-built website. It provides what you need to create a tried and tested homepage. It will be aligned with user expectations. No matter the industry or niche, the right structure has already been embedded. There are plenty of people, including web designers, who would rather take a risk than be a follower. There’s certainly nothing wrong with that. Experimenting is something that should normally be encouraged. Maybe your client is a risk taker with some far-out ideas, and someone who would encourage you to follow suit. On the other hand, your client might be a corporation or a large business. Then, it’s usually better to adhere to the norm when it comes to website design. Pre-built websites can settle the argument for you since they ’re structured. They can please virtually any client yet allow you to add your own (or your client’s) creative touches. 4. Which of these 5 clever ideas of mine will go best with this project? The correct answer is usually “no more than one of them, and maybe not even that one”. Creativity is a must for a web designer. Yet, having too many ideas (the TMI syndrome) tends to create problems by muddying the waters. TMI is not a nice problem to have. Browse Be Theme’s all-inclusive catalog of pre-built websites. Search by industry type, business niche, or type of content. Pick a template that closely matches how you envision your design. Customize it (perhaps with one of your great ideas in mind). This way, you’ll get your creative vision implemented quickly and easily. This is without creating a design that would make Frankenstein proud. Most clients tend to be expert at what they do, or at least think they are. Those who merely think they are can often give you fits, even if their 100% right. You want to please your client of course, and you want his or her online presence to be a successful one. So what do you do if what you believe a client needs and what that client wants are not one and the same thing? The best approach is to use a pre-built website that’s specific to the client’s industry. You’ll be able to deliver high-quality work while pointing out that it adheres to the standards. If the client doesn’t agree with the standards, it’s the client’s problem; but the chances are good that he or she will. Pre-built websites are highly-sophisticated design tools. They are designed to get projects off to a fast start. They offer a proven way to improve your designs. They’re in tune with the latest industry design trends, and the UX you seek to create is already there. They can help you choose the best of multiple ideas or give you a better one. They allow plenty of room for creativity. They also can help to convince clients that following industry standards is the better way to go. Be’s library of 390+ pre-built websites (and all future releases) can be yours for just $59.